At gamescom, it was revealed that The Sims 4 Get Together Expansion Pack *, coming this November. It adds the new European-inspired World of Windenburg, fun group activities, new Skills, and a brand new feature called Clubs that allows Sims to totally break the rules of the game. Sims have autonomy in The Sims 4 , which is a fancy way of saying they do their own thing when you let them. First, they’ll try to do whatever they physically need (like eating or sleeping), then, they’ll do what their Traits tell them to do (like being Flirty or Mischievous). Clubs allow you to create new rules for Sims that supersede the logic they typically follow. 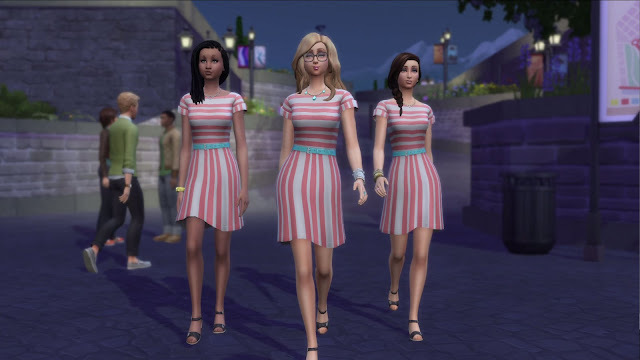 When you create a Club in The Sims 4 Get Together, you can pick their preferred hangout location, choose what they wear when they get together, and decide who is allowed into your Club. However, Clubs are much more than just groups of Sims – they’re groups that will follow a set of guidelines set by you, which works extremely well with a simulation-driven game. Should the Fitness Crew meet at the Gym, or work out in the middle of the town square? Should Sims in the Child life stage be allowed in? Should only children be allowed in? What about their outfits? Typical workout attire, or formal wear? You can encourage them to be mean to the Romance Club, or get romantic with the Misfit Club. But here’s where it gets really cool: once your Sims are together with their Club (or what we refer to internally as a Club Gathering), they can act against the things they’d typically do if the rules of the Club dictate it. Characteristically peaceful Sims might start a brawl if they’re in a Fight Club, and shy Sims could end up being amorous if their Flirty Club encourages it. These rules will only supercede behavior when your Sim is in a Club Gathering. When we first started out, we wanted the Club rules to apply all the time. We quickly realized that if this was the case, Sims’ lives would be overrun by Clubs and the Sims normal behaviors would never shine through. They’d also run into problems with rules from different Clubs if they clashed, keeping them in a constant state of conflict. What if my Sim is in one club that loves to watch TV and another club that hates it? Besides spending time on making sure the rules worked, we also burned out a lot of markers doodling on the whiteboard to make sure you were able to quickly figure out who around you was in a Club. The result is fairly simple, and lets you hover over Sims to learn their name and which Clubs they’re members of, and quickly scan an area to see which Clubs are having a gathering, and who is the leader of the different Clubs. On that same note, we wanted to make sure those different Clubs were just that: different. We aspired to let players do anything and everything with Clubs, which actually led to a potential problem… how the heck do we even display all those choices? We have hundreds of interactions in the game, and sorting through all of them would be overwhelming. When we hit moments such as this, we fall back on our instincts as Sim players, gamers, and storytellers. We began creating hypothetical groups, normal and strange, and realized that we could group many of the choices into these different buckets and let the Sims dynamically choose specific items within that category. For example, instead of saying “This Club likes to Kiss, Flirt, and use Pick Up Lines,” players will instead say that the “Club likes to Flirt,” which encompasses all those things. You can still get more specific, choosing targets for your rules if you’d like. Want to make a Club that likes to Fight and be Mean, but only to members of a specific other Club? You can do that! Your Clubs can have 10 rules total (5 encouraged rules and 5 discouraged). We’re still tinkering with that number, but we think we found the sweet spot. If your Sim had 20 things they were trying to do, you wouldn’t be able to tell that they had a unique behavior. At that point, they just look like… normal Sims. This number lets you create unique Clubs that’ll lead to Sims doing things that will stand out and read as different and interesting.